Nestled beside the Neva River in St. Petersburg is one of the largest and oldest museums in the world. 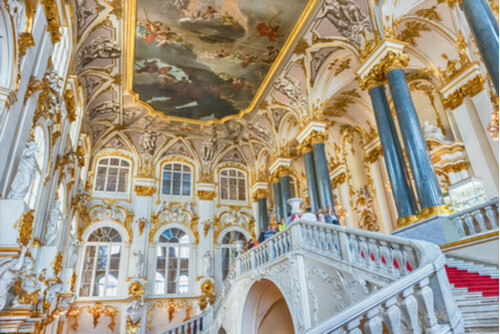 The magnificent Gosudarstvenny Ermitazh or State Hermitage Museum, is housed across five historic buildings, including the spectacular Winter Palace, and boasts a collection of more than three million exhibits from all corners of the globe. Wander the halls and you’ll come across works by many of the world’s great artists, from Monet to da Vinci and Rembrandt. The museum dates back to 1764, when Catherine the Great acquired a 225-work collection from Berlin merchant Gotzkowsky. The works – mostly by Dutch and Flemish artists – were originally intended for King Frederick II of Prussia and while they were of mixed quality, they formed the basis for the State Hermitage Museum. 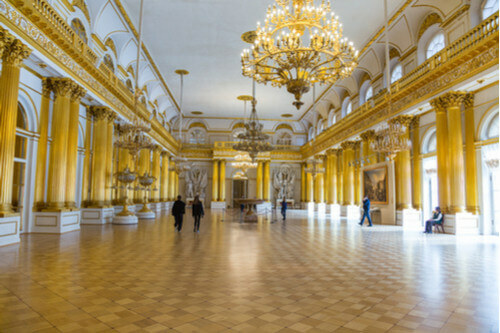 After her coronation to Empress of Russia, Catherine the Great became the royal mistress of the Winter Palace and exhibited her paintings throughout the building’s 460 rooms. As her art collection expanded with acquisitions from European counts, barons and prime ministers, she ordered the construction of additional baroque-style structures such as the Small and Great hermitages. From the outside, the Winter Palace exudes opulence. A perfect example of 18th-century baroque architecture, its white, green and gold facade and rooftop statues command attention from all who visit. Step through one of the main archways and you’ll be enveloped by the grandiosity. Towering columns and alabaster statues mark the path to the Jordan Hall, where a huge marble staircase spans the height of the palace. Continue upstairs and get lost in a maze of hallways among the priceless artworks that line its walls. 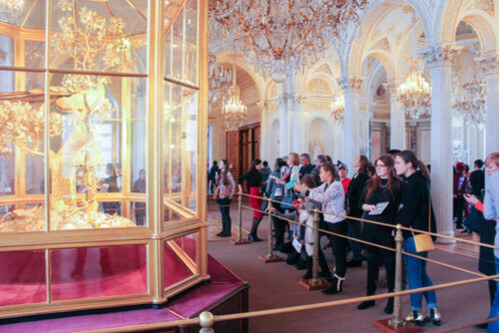 Cross into the Pavilion Hall of the Small Hermitage and you’ll come to the famous gold Peacock clock encased in a glass aviary. Keep an eye out for names like Raphael and Van Gogh on your journey. While the complex functions as a museum, the buildings themselves are works of art. 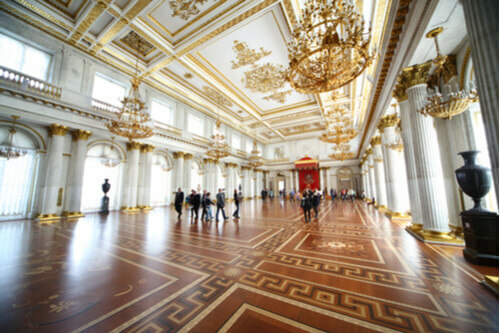 From the baroque and neoclassical architectural influences, to the detail in every column and wall carving, the Hermitage was designed to showcase Russian prestige and certainly succeeds in doing so. Just don’t forget to look up - ceilings throughout the palace feature stunning decorations such as frescoes and gold arabesque detailing.